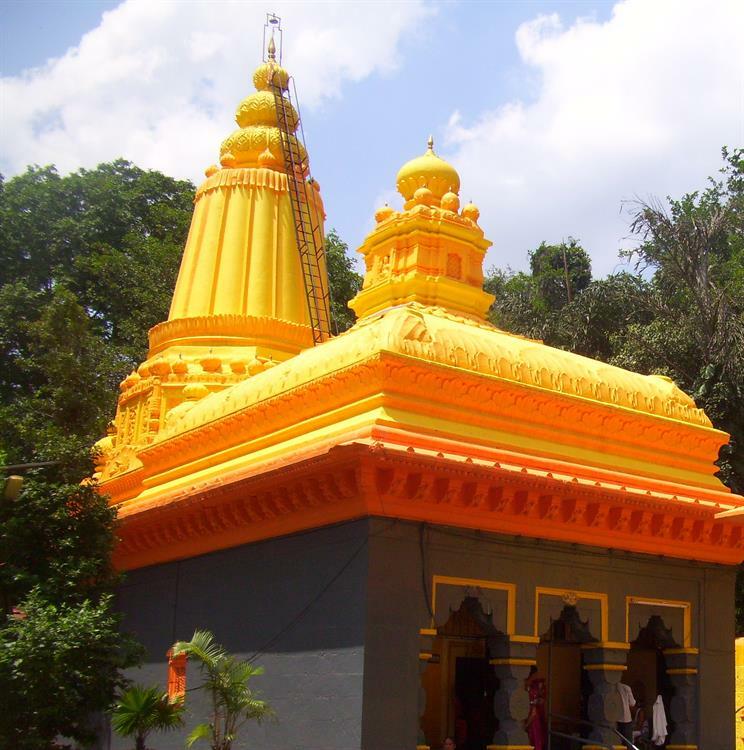 Baneshwar is a temple located at the midst of a jungle which is just 45 kms away from Pune on its southwest part. It is a temple that has been discovered in the recent days and that dates way back to 1749. It has a waterfall flowing just beside the temple and a bird sanctuary that trails along the garden which itself is a nice tourist spot. Reach there anytime but have a look at this article before you pack your bags. The word "Baneshwar" is coined with a very literal sense where "Ban" means Forest and Ishwar stands for God. So when the God resides within a forest, the place can be rightly named as Baneshwar. This name is given to the Baneshwar temple which is located in the midst of a dense green patch. The place looked appeared to be quite interesting and appealing when our college group was looking for a place to hang out and have a nice day out as it was our supposedly "last trip" of our "university days". None had any objection as it was just about 45 kms away from Pune. We all gathered at our main gate of University of Pune, and we moved ahead in one of our classmate's car towards the winding road of Baneshwar. That was our first visit to Baneshwar. 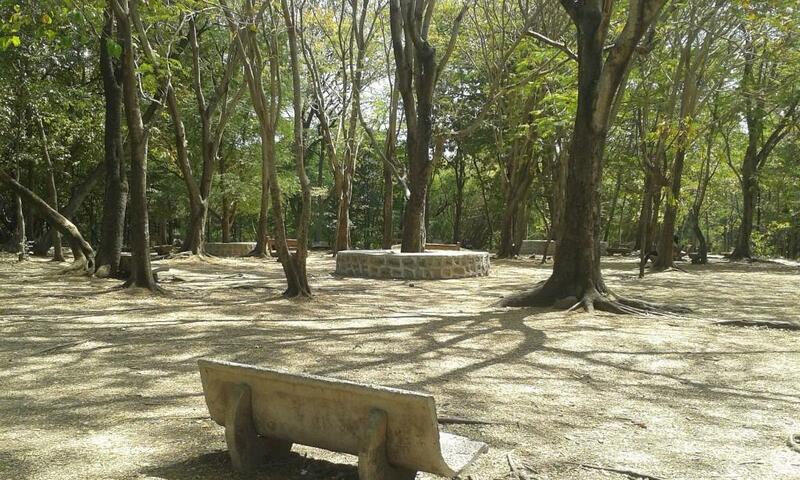 The place called me again and again, and I visited two more times with my family and friends. In all the trips Baneshwar was equally inviting and attractive in its own special ways. Baneshwar is mainly an ancient temple of Shiva which is located in the village of Nasarapur which is about 36 km away from Pune on the southwest part of the city. Though the age of the temple goes way back to the medieval period dated 1749, it is discovered just in recent days. The temple was been constructed by Peshwa Nanasaheb, the son of Peshwa Bajirao I. It is said that the total cost of the construction took 11,426 Rupees, 8 Aane, 6 Paise calculating the rates of those days. The most intriguing thing is that the temple has an important bell which was incidentally captured by Chimaji Appa who defeated the Portuguese in the battle of Bassien in 1739. But what is more surprising is that the bell has enbossed on it the year 1683 and has a Cross engraved on it, which indicates that it belonged to some church and was later on transported to India and was gifted to the king as a token of victory. There aren't many options to reach Baneshwar, but by choosing your transport, you choose the route as well. One can start on the Solapur road, reach Swargate, and from the Swargate junction turn left , heading towards the Katraj side. By going straight you will pass by the Katraj Zoo Garden near the Katraj Ghat. Continue with the adjoined NH4 coming from Mumbai. After you cross the first toll booth another 11 kms will take you to a junction from where you need to cross only 3 kms to reach Shree Baneshwar. You can also take one of the Pune Government MSRTC buses which are available from the Swargate bus stand. The road that takes you to the place is itself a memorable one. The winding hilly roads would welcome you with its splendid collection of colourful flowers and diverse terrain. You might face a little bit of traffic jam, as the road keeps quite busy. Once you reach the spot, you get to see a small opening with small shacks that keep all the Puja items and flowers to offer. Some snack bars are also available to keep you refreshed. The temple is right there within a small compound. An ancient Shivalinga goes deep inside one of the architectural structures and you really feel somewhere time has been stuck in the dark corners of the temple that keeps a cool atmosphere even in the days of hot summer. 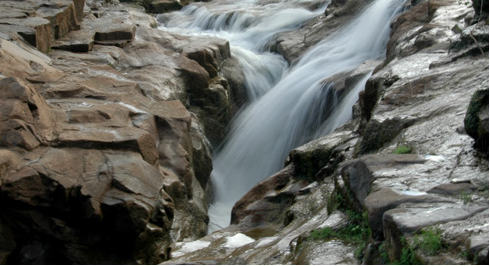 The waterfall is the main attraction in Baneshwar. 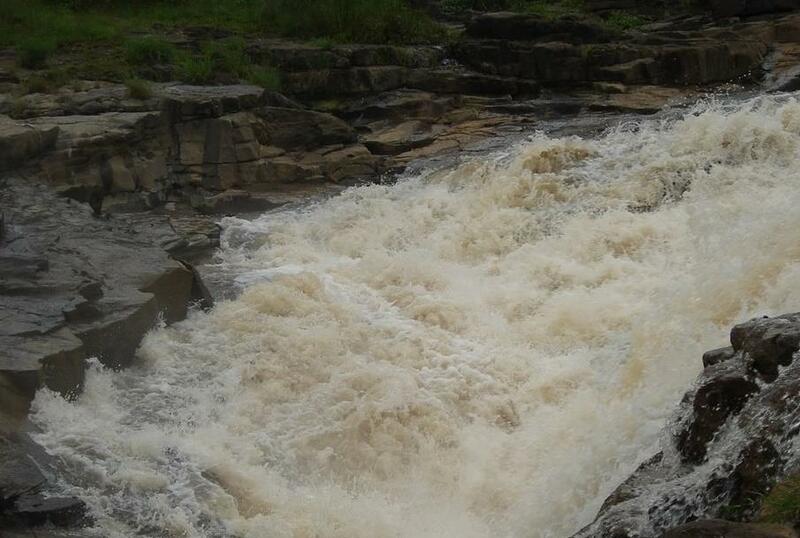 The waterfall doesn't fall much from a height , rather trips and falls over the boulders taking the shape of a river. In summer and winter the volume of the water goes down and the entire place becomes just an ideal place for picnic where you can sit on the rocks listening to the sweet chirping of birds that throng there throughout the year. But in rainy season, the entire scenario changes! The river flows with full force flooding the banks of thee river and the garden paths transform into a muddy track that won't even let you stand straight on your feet. But that "slippery slope" does have its own charm and exciting turns. Baneshwar isn't only all about the temple. Rather it is more of a place whee trekkers and tourists visit for its exemplary garden going natural with its flora and fauna. A good number of amphibian species gather there. And Hornbills are one of the most common bird you get to see there. 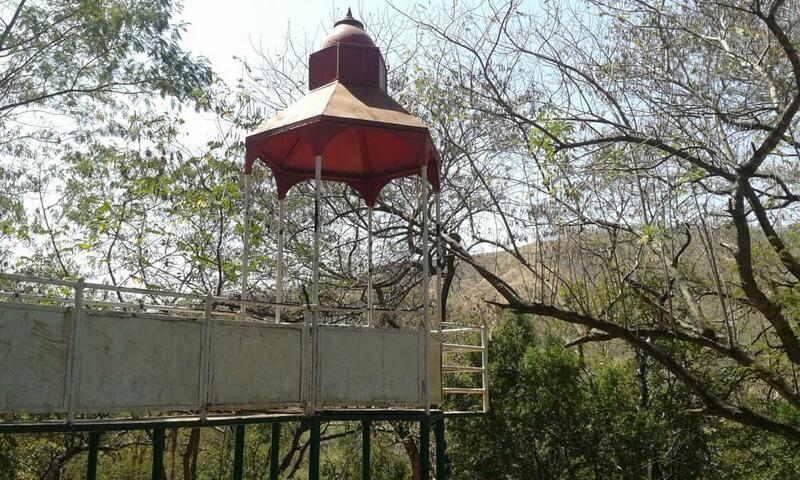 The bird sanctuary has a nice bird watching tower where you can sit hours together (if you find it unoccupied) and enjoy the scenic beauty of the place. It was three times that I have visited this place. So, I can tell you that Baneshwar is a place for "all times". In summer you get a cool atmosphere where the greenery would give you a day to hide from sunburns. In winter you simply explore the place and make yourself comfortable at any corner. In rains, test your balancing skills and simply glide through the mud to the bank of the river, can get a bath only if you are a good swimmer, as things wouldn't be that gentle with you in those days. For summer: Wear light clothes, carry a set of sunglasses and hats, enough drinking water and soothing snacks like cold drinks, juicy fruits etc. For Winter: Things would be comfortable otherwise, but suddenly the temperature may come down, and while on road, you need to protect yourself from the cold breeze, so better to carry some woolens. For Rainy Seasons: This is the time you need to prepare well. Carry an extra set of clothes, a pair of shoes, something to tie the shoes around your waist, as you cannot wear them through the muddy tracks. To avoid an untimely visit, reach there within these set of timings. Monday - Friday: 6.00 AM - 8.00 PM , Saturday: 6.00 AM - 8.00 PM , Sunday: 6.00 AM - 8.00 PM , Public Holidays: 6.00 AM - 8.00 PM. The temple is so close to Pune. Pune has so many museums and forts around which are truly attractive to travellers. If the article mentions any tourist places around Baneshwar, that'd be interesting. This is really an informative blog which actually gives interest and motivation to learn new trendings things in this field. The blog content is well-detailed and explanatory. Morachi Chincholi also provide such informative blogs for the site visitors. Sir, if you don't mind our company would like to share some of our blogs on your website. I was searching for a place nearby Pune for a one-day visit. After going through this nicely written article, I got a clear idea about Baneshwar and am planning to visit that place. Thanks to the author for composing such an informative article. And, if you have some leisure hours, kindly write some more articles regarding weekend destinations nearby Pune. These type of articles are comparatively rare to find on the web. Superb and Interesting blog. Thanks for sharing this information.